Recent innovations have made data security achievable for organizations of all sizes and industries. It’s now possible to quickly and effectively reduce the risk of data breaches and leaks. Join this webinar to learn how integrated data classification and data protection from two industry leaders, Boldon James and Seclore, makes data security as straightforward as 1-2-3. Sicherheit von Computernetzwerken, Business Apps, Mobil- und Endgeräten ist - trotz rasch und erheblich steigenden Investitionen – kaum zu erreichen und schwer unter Kontrolle zu bringen. Risiken unbefugter Datenzugriffe, Datenpannen und Insider-Attacken bleiben bestehen. Um diese Risiken und Lücken ganzheitlich und nachhaltig zu eliminieren, ist eine zusätzliche Sicherheitsstufe für vertrauliche und geschäftskritische Informationen und Dokumente erforderlich. Die Lösung ist eine «DataCentric Security Plattform», die unter anderem Daten-Klassifizierung und Rights Management miteinander verbindet und integriert. Dabei behält der Urheber und Autor immer die Kontrolle und bestimmt mit welchen Berechtigungen Wer, Was, Wo und Wie lange ausführen kann. Der Ersteller eines Dokumentes kann jederzeit Berechtigungen anpassen, beziehungsweise ändern oder widerrufen, selbst nachdem ein Dokument oder eine Information bereits versendet oder bearbeitet wurde. Das kongeniale Zusammenspiel von Seclore mit Boldon James gehört zur neusten Generation der Daten- und Informationssicherheit und revolutioniert Daten-Klassifizierung und Daten-Sicherheit in einmaliger Art und Weise. Schutz von bereits getätigten Investitionen, Automatisierung, intelligente Nutzung von vorhanden Informationen sowie Sicherheitsstrukturen und Benutzerfreundlichkeit sind nur einige der Vorteile. Seclore und Boldon James sind die globalen Marktführer für Rights Management und Datenklassifizierung. Durch die Integration beider Lösungen erhalten Organisationen das bestmögliche Ergebnis. Dabei ergibt sich eine Vielzahl von weiteren Vorteilen, Synergien und Nutzen für Unternehmen und Anwender. Nutzen Sie diese einmalige Gelegenheit und erleben Sie selbst in einer «Live-Session» mit Live-Demo, wie schnell Sie Ihre Daten-Sicherheitslücken mit Seclore und Boldon James gemeinsam schließen können! In a world where data breaches are inevitable, EVERY organization is working to improve their security posture. Security organizations are looking to take advantage of artificial intelligence (AI) and machine learning (ML), but are overlooking the actual intelligence that resides in their HUMAN resources. According to Palo Alto, AI and machine learning is primarily about automation and simplifying monotonous tasks associated with cyber security policy definition and enforcement. The words predictive, self-configuring and autonomic should all come to mind when thinking about AI/ML frameworks. From a Boldon James perspective, end-user driven data classification affects security where the data begins and captures ACTUAL intelligence, namely the content and context, held by the creator of the data. Instead of relying on AI or machine learning to guess at the classification of data, organizations can harness the power of their HUMAN resources and engage the end-user in the security policy, making them responsible for classifying the data they create. New design files need to be protected so that data doesn't fall into the wrong hands, or the right ones too soon. CAD Classifier brings the benefits of data classification to key design documents across a variety of CAD applications, including AutoCAD and Draftsight, applying visual and metadata labels to guard against inappropriate dissemination. Boldon James Box Classifier extends document classification into Box Cloud-based storage and sharing, ensuring organizations of all sizes have a unified and seamless solution for classification-based data protection and control regardless of its location. Martin Sugden, CEO at Boldon James, explains how a best-of-breed data classification policy can be used to achieve organisational evolution. The way in which data classification contributes to the success of a business by involving the user community and bringing security to the forefront of their thinking, is a key topic of discussion. Also explored, is how best to approach the implementation of a data classification policy to achieve maximum value, how Boldon James’ solution differs from other technologies and furthermore, how it can evolve and grow with your business. David Langton, VP Marketing & Alliances, identifies the power of Boldon James’ technology partnerships and the key role they play in supporting the business. The security and data management technology landscape is changing, and organisations are responding to this by integrating data classification to extend complimentary solutions. David discusses what drives the technology integration roadmap at Boldon James, including the types of partners we work with and the solutions we consider most complimentary to Boldon James Classifier and beneficial to our customers. Paul Johnson, Vice President EMEA at Boldon James, identifies the key stages to achieving operational success in your organisation. The crucial difference between information and data, and the experiences our own clients have faced are just some of the things discussed in this video interview; which provides a detailed insight into how your user community can utilise data classification to improve business efficiency, workflow and compliance. Luke Shutler, EMEA Channel Director at Boldon James, discusses how in the three months since its enforcement, GDPR has effected the way in which organisations are treating, and dealing with, their data. Specifically, how the new legislation has changed the way users think about data as a whole and furthermore, how they handle different types of organisational data. Also explored is how the use of data classification has facilitated change in these data processes, aiding compliance and improving efficiency among user communities. 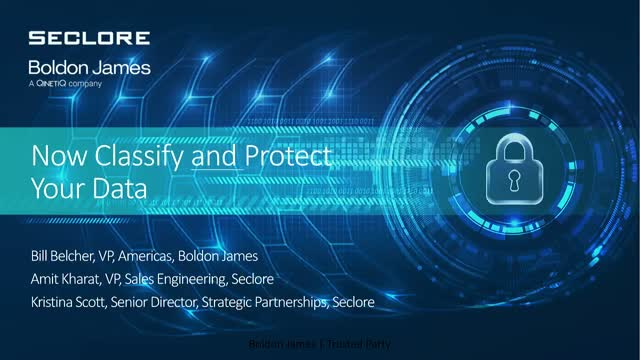 Short video of Seclore Data Classification powered by Boldon James demonstrating different classification scenarios, Classification-based Automatic Protection, Classification, Prompted Classification and Keyword-based Classification.